South Korea has decided to exempt a part of an inter-Korean road project from a preliminary feasibility study, reports citing officials said Sunday, in a sign that the South hopes to make as much progress as it can this year on inter-Korean cooperation projects. According to Yonhap News Agency, the construction of an 11.8-kilometer highway between Munsan and Dorasan Station in Paju, just south of the inter-Korean border, will be exempted from the customary feasibility study. The proposal was submitted by the Ministry of Land, Infrastructure and Transport last month and accepted by the Ministry of Strategy and Finance. The Munsan-Dorasan highway is the South Korean section of the Gyeongui Road, which runs through the west coast of the Korean Peninsula. A Transportation Ministry official told Yonhap that the decision was based on the nature of the project, which is “a subject of inter-Korean cooperation that cannot be determined solely by economic efficiency” The construction of the South Korean part of the Gyeongui Road can be pursued regardless of international sanctions against the North, the official added. The highway construction project requires over 50 billion won ($45 million), making it subject to a preliminary feasibility study. The study usually takes at least six months or up to three to four years depending on the project. The government has allocated 517.9 billion won for the Munsan-Dorasan highway in the South. It plans to start construction by the end of the year, according to the Transportation Ministry, with completion expected by 2020. A 171-kilometer highway between Pyongyang and Kaesong will be built once denuclearization of the Korean Peninsula is achieved and economic sanctions on the North are lifted, the government said. The construction of a 104.6-kilometer highway between Gangneung and Jejin in Gangwon Province was also a potential candidate for the feasibility study exemption, but the Seoul government decided not to extend the same exemption for now. The section is part of the Donghae Road running through the east coast of the peninsula. About 2.4 trillion won has been allocated for the Gangneung-Jejin project. In August, the two Koreas carried out a joint survey of the North Korean side of the Gyeongui Road, which connects the North’s border town of Kaesong to Pyongyang. 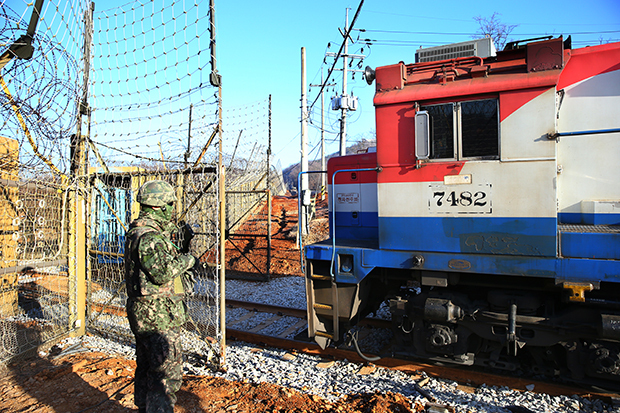 The Seoul government’s decision comes after the start of an 18-day joint railway inspection on Friday involving the test operation of a South Korean train on a North Korean rail track. Inter-Korean railway and road projects were delayed over what is believed to be US concerns about possible violations of UN sanctions on North Korea. However, the railway inspection was given the green light recently, as the US expressed strong support for the survey and the UN Security Council granted a sanctions exemption. Experts warned, however, that the UN exemption is limited to the inspection part of the project. The Seoul government appears to be sticking to its plan to hold a groundbreaking ceremony for the inter-Korean railway and road connection projects this year, as agreed upon by their leaders in September.